Were you going to eat that moldy banana? Found in Tokyo hotel room. Sounds like a failed experiment in the LHC to create anti-matter. 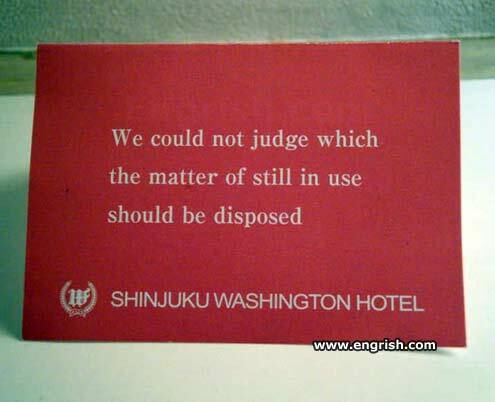 Judge not, lest ye be disposed. So is that sign still in use, or has it been disposed of? 1) We can’t judge what’s the matter with you – you’re still using this stuff that clearly should be disposed. 2) So what does it matter if you’re still disposed to use this stuff – who are we to judge? 3) It doesn’t matter if you were still using your stuff because we threw it out. A new trial is hereby ordered in the matter of Still In Use v. Should Be Disposed. The matter of the still should be disposed either when it stops producing alcohol or just before the revenuers show up. Lack of judgement – closed business – should have hired Dukes of Hazard. It all sounds like rubbish to me. to dispose or not to dispose? hmm……that’s the question…. Due to the hung jury, the matter has been remanded for retrial. Is this an ontological or an epistemological question? Probably not, but we could certainly judge which the matter of loudness is disposed of no. Body should be islent!